The Trainer 101 is a hand held smoke generator with an integrated battery giving total freedom of movement to the operator. This also allows the operator an element of surprise when planning an exercise. Can be activated by the on handle button or via the optional wireless radio remote. No heat up required and provides approximately 65 m3 (2295 cubic Feet) per minute. produces a dense, harmless vapour – safe to use and handle. The perfect system for any training scenario. Easily provide a number of smoke effects for the most accurate and realistic training scenario. The perfect system. 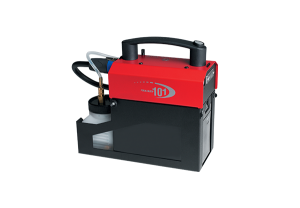 The Trainer 101 is a compact and powerful hand-held smoke generator for simulation, training and commercial applications. Power is supplied by the integrated battery, giving total freedom of movement to the operator. Smoke is produced one second after pressing the start button, and smoke output can be varied from a light to dense smoke. The Trainer 101 is ideal where you require minutes of operation without having access to power, or simply want the freedom to carry the unit anywhere it is needed. Click to view Heat Exchanger: 400w -12v DC / 10 Second heating time and thermal Protection. Power: 12v DC @ 1000ma battery charger 100v – 240v 50/60hz. Size: (LxHxW) 223mm x 100mm x 210mm.